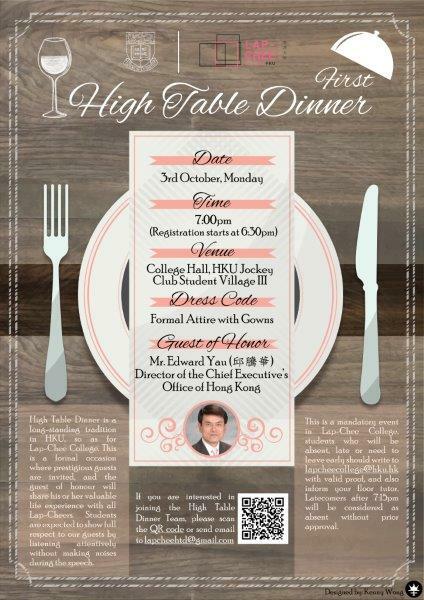 Please be reminded that the coming Lap-Chee College High Table will be held on Monday, 3 October 2016. As this is a compulsory event in Lap-Chee College, students who will be absent, late or need to leave early due to classes should write to lapcheecollege@hku.hk with valid proof, and also inform your floor tutor before Friday, 30 September 2016. Latecomers after 7:15pm will be considered as absent without prior approval. Dress Code: Formal attire with gowns. Students who do not dress according to this requirement will be asked to leave the College Hall and will be regarded as absence. Seating Arrangement: Please sit according to the instructions from the Floor Management Team onsite. Please kindly fill in the form below to let us know your preference for the main course: https://drive.google.com/open?id=1Gm15iV31MbrxZNF1IvzsjDCVoCM5qgFc_v1lYuaXV8E before Wednesday, 28 September 2016. Please bring along your student card for registration. In order to relieve rush-hour crowds at the elevators and the registration line, please take the stairs to podium and arrive at 6:30 pm.